The Scotch Malt Whisky Society tasting evening 5th November 2009. Jim, Dougie and Nicola (better known as The Whisky Boys ) got a lift from Cathie to Falkirk High Station for a train ride through to Waverly station in Edinburgh, we arrived at approx 5.15 pm and our appointment with the Whisky Society was for 6 pm. So we had a little time to spare, we did manage to walk over to Queen Street and stopped of at Jekyll and Hyde pub, which was quite a wee experience. The imagery outside the pub is dark and gothic, all the way down to the real flame lamps that light the frontage. The name is pure Edinburgh and comes, of course, from the title of the Robert Louis Stevenson’s 1886 novel: “The Strange Case of Dr Jekyll and Mr. Hyde”. was about good and evil, light and dark. The pub tends to focus on the darker side of its theme. One result is that if you go in on a bright sunny day, you are very unlikely to see much beyond the first couple of yards until your eyes have adjusted. 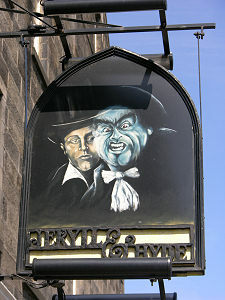 Edinburgh is home to many dark pubs, but the Jekyll and Hyde probably takes the award for being the darkest. Once you eyes have adjusted you make your way past the bar and up sets of stairs to successive levels of the pub: the further towards the rear you go, the further you have to climb. Until you get to the back, anyway, for here you find yourself looking down into a rear room that comes complete with windows and natural light. One of the levels you ascend through appears to be home to a library. Your eyes have to be especially well adjusted to realise that parts of the bookshelves form the doors to the loos. We all had a wee dram, each of us partaking of a delightful Oban Single Malt. It was now time to head for The Scotch Malt Whisky Society, on arrival we were met by two lovely young ladies who showed us up to the Hunter room, the venue for our tasting. Born out of a love of whisky, The Scotch Malt Whisky Society was established in Edinburgh in 1983. Now, 25 years on, the Society is internationally recognised as one of the most reliable sources of the finest and most exclusive single cask, single malt whiskies. Some of the most scrupulous noses in the business, in the form of the Society’s respected Tasting Panel, only the very best single cask single malt whiskies make the cut. Bottling more than 200 single casks every year from a range of 125 distilleries, the Society has made a huge contribution to the appreciation of single malt whisky in the last 25 years. We entered the room to be met by Olaf our host for the evening. First impressions was of a well run and extremely professional organisation, and our first impressions were not wrong. There were five other guest tasters that night, and the table was laid out with tasting glasses and water for our drams. Cask No. 37.45 Cragganmore Speyside Single Malt Scotch Whisky. 22 Yrs Old. 56% Alc/vol. One of only 230 Bottles. Cask No. 26.63 Clynelish Coastal/Highland Single Malt Scotch Whisky. 12 Yrs Old. 58.7% Alc/vol. One of only 580 Bottles. Cask No. 35.32 Glen Moray Speyside Single Malt Scotch Whisky. 34 Yrs Old. 55.1% Alc/vol. One of only 183. Cask No. 28.22 Tullibardine Highland Single Malt Scotch Whisky. 19 Yrs Old. 57.8% Alc/vol. One of only 631 Bottles. Cask No. 10.70 Bunnahabhain Islay Single Malt Scotch Whisky. 11 Yrs Old. 55.7% Alc/vol. One of only 283 Bottles. As you can see from the above The Society certainly did not skimp on either the quality or selection of Single Malts we all enjoyed that evening, every one was of exceptional quality, but we all three Whisky Boys agreed that the winner was the final dram, the Bunnahabhain. We suggest all our readers visit The Scotch Malt Whisky Society website www.smws.com and you will learn a lot about the Society including how to become a member. We were given a short tour of the Queen Street premises including the dinning room and the bar where we continued to enjoy some excellent and rare malts. Cask No. 18.26 Inchgower Speyside Single Malt Scotch Whisky. 23 Yrs Old. 48.3% Alc/vol. Cask No. 3.149 Bowmore Islay Single Malt Scotch Whisky. 10 Yrs Old. 56.4% Alc/vol. One of only 287 Bottles. Cask No. 10.70 Bunnahabhain Islay Single Malt Scotch Whisky. 11 Yrs Old. 55.75 Alc/vol. One of only 283 Bottles. Cask No. 66.31 Ardmore Speyside/Highland Single Malt Scotch Whisky. 11 Yrs Old. 57.6% Vol/alc. One of only 738 Bottles. We The Whisky Boys would now like to thank The Society and in particular Olaf for his great input and knowledge he passed on to us that night, well done Olaf a great Ambassador for not only The Society but for Single Malt Scotch Whiskies. The Inchgower Distillery is situated near the mouth of the River Spey and by the fishing village of Buckie and near Cullen. It was founded in 1871 by Alexander Wilson & Co Ltd. Alexander was the nephew of the founder of the Tochineal Distillery, John Wilson. Inchgower was built to replace Tochineal after it was closed due to shortage of water. The location of Inchgower supplied plentiful water from the Letter Burn and Aultmore springs. In 1903, Inchgower was liquidated. In the 1930s, it was purchased along with the family home at Arradoul House by the Buckie Town Council for £1000. In 1936, it was purchased by Arthur Bell & Sons Ltd. reputedly for £4000 which included the manager’s house and seven cottages. Guinness acquired Arthur Bell & Sons in 1985, Today the brand owner is Diageo. The majority of production from Inchgower contributes to Bell’s, Johnny Walker and White Horse blended whiskies. Just 1% of Inchgower is sold as a single malt. Inchgower offers a malt of complex aroma and fruity, spicy taste with a hint of salt. Bottles of Inchgower feature the distillery symbol of an Oyster Catcher, a bird that is an annual visitor to the area. Cask No. 18.26 Inchgower Speyside Single Malt Scotch Whisky. 23 Years Old. 48.3% Alc/vol. This, as you are aware a Single Cask bottling of The Scotch Malt Whisky Society. Colour…Pale Gold with Lemon Highlights. Nose…Light sweet fruits on digestive biscuits. Taste…Full bodied, dried fruit of citrus, lemon tart? a spicy tingle with a sprinkle of salt. Finish…Long, lingering spicy sweetness, and hint of ginger and honey. Nose…Full on sherry trifle, fabulous fruity and creamy aroma. Taste…A very complex dram with warmth and tingles galore, still plenty of fruit and Rowantrees fruit gums. Finish…Long and smooth, nicely lingering fruit and a wee spot of spice. As you would expect a great wee tasting from a well chosen Cask by The Society. The Whisky Boys will have to look closer into becoming a member(s) of this prestigeous and exciting Society. The evening in Edinburgh was great and our tasting a few days later was special. Great article on SMWS (and the Jekyll & Hyde) but the Edinburgh members room is located on Queen Street no 28 and not George Street as mentioned. Apart from the 18.26 you don’t actually include any other tasting notes from the 6 bottlings that you tasted that night which is a shame. 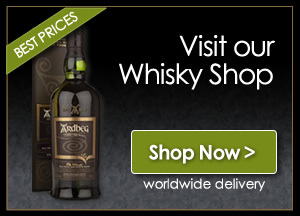 I have actually tried these whiskeys and I was blown away from the rich taste and tradition that comes along with it. Love the article and hope to see more from you guys.